The highlight of the Great Britain section of the auction included a superb range of Seahorse stamps from Waterlow, De La Rue & Bradbury Wilkinson printings with many better shades. 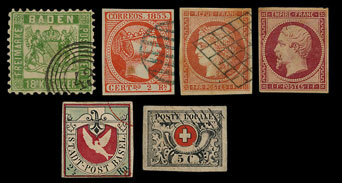 High prices were achieved for De La Rue 2/6d Cinnamon-brown, brown & reddish-brown. 5/- Waterlow rose-carmine & De La Rue pale-carmine. 10/- De La Rue deep blue, Bradbury Wilkinson grey-blue. Waterlow £1 deep green & dull blue green. A range Falkland Islands photographic essays for various issues sold for £360. During the 1st World War the German Colonial forces in German East Africa fought a long defensive campaign until in 1917 the Allied Forces took the area that later became Tanganyika. When the area came under civilian control stamps from East Africa & Uganda were overprinted with ‘G.E.A’ for usage. 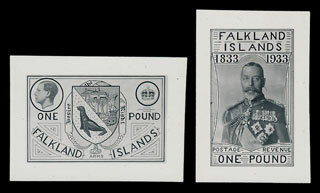 The auction included a 1917-21 ‘SPECIMEN’ set which sold for £408. A used set to 50r sold for £990 and a mint set for £630. Beautiful collections of French Colonial imperf colour proofs & trials sold for over 3 times the estimates. An extensive collection (over 1200 items) of world forgeries & proofs described as ‘ranging from the crude to the dangerous’ attracted a lot of interest. From an estimate of £650 the lot achieved £1,560. The full catalogue for this sale will be on our website in the next few weeks or keep an eye on our Twitter and Facebook pages which will include updates of our latest auction news.